Paradigm defined is "the totality of thoughts, perceptions and values that form a particular vision of reality, a vision that is the basis of the way a person or society organizes itself." Paradigms provide a frame of reference for living. They are not the truth but rather models of reality. We all look at the world around us in accordance with a certain paradigm. The paradigm we use depends on what we believe is reliable and true. What we perceive, whether normal or abnormal, conscious or unconscious, is subject to the limitations and distortions produced by our inherited and socially conditional nature. When a frame of reference changes; it is called a paradigm shift. It is a radical change of our fundamental and underlying beliefs or theories; conscious and unconscious views of reality. In this session you will clearly define your existing paradigm with Carol. By unplugging your previous, unnecessary belief systems, whether they were created in a past life, your family history, DNA or in this lifetime you will be free to take a quantum leap forward on your desired path. Carol then sets the framework for your new paradigm. 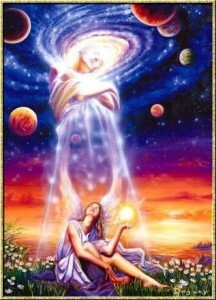 She works with your guides and the angelic realm to set up your new desired reality. All aspects are locked into the new paradigm: past, present and future realities, your multi-dimensional selves, etc.